Just as a thought experiment, how would you reboot B5, if it were up to you? What would you keep from the original show? What would you jettison? What would you invent? How would you recast it? What format would it be in? Would it be a modern netflix heavy-arc like "House of Cards," or use the "Lostback" formula, or what? Ideas can be as elaborate or as realistic as you like. I'm just interested in how you'd do it if you had the firm commitment from a studio who'd leave you to your own devices. Ok, how would you reboot crusade? I wouldn't do it as-filmed. I'd have it based on Tuzanor, or maybe even out of B5 (As a hub, not the main base) with a squadron of White Stars (All interchangeable). It'd be primarily about 7 or 10 rangers, who'd get sent out in various combinations, based on their respective skills, and the only B5 cast who'd be a regular would be Delenn. We'd bump into the others, though. It'd start off immediately after "Objects at Rest," with a season of planet-of-the-week adventures, the Rangers getting involved in creatign the peace and all. Then the Telepath Crisis would start, and take up most of the 2nd seson. (It started earlier than Lyta was expecting). I'd have the Drakh Plague/War start during the Telepath Crisis, and continue after the crisis is resolved, and we'd segue into whatever it was that JMS had planned as the main storyline of B5. I would love Joe to reboot B5 based on his original concept. (well i seem to remember sinclair was due to make it through the series and travel back in time to become valen, although i could be wrong). Make it as grim and as dark as hell. Set a more adult theme. Make the shadows and Vorlons really scary. Don't hold back. Show us the Icarus (or another different ship) arriving at z'ha'dum and what 'really' happened to the crew (as in the shadow within sort of thing). Show us what happens to those 'chosen' by the vorlons. Just expand on what we know. Tweak it a little storywise. I'd reboot Crusade using the existing Crusade scripts except War Zone, and as many of the original actors as possible. Matheson (DDK in H50V2) would have to be re-cast, and probably Gideon as well. I'd love to have Gary Cole back as Gideon. Peter Woodward as Galen and Carrie Dobro as Dureena and Tracy Scoggins as Lochley are must haves. Bester would unfortunately have to be re-cast (Maybe not? Hair dye and makeup?).. Brooks should be back as Eilerson. It wouldn't bother me if they re-cast Dr.Chambers. I'd modify Appearance and Other Deceits to remove all trace of the uniform change. I'd pick one uniform Gray/Red or Black and stick with it. I would love Joe to reboot B5 based on his original concept. (well i seem to remember sinclair was due to make it through the series and travel back in time to become valen, although i could be wrong). Politely, you're wrong. The whole "Valen" arc was introduced as a way to write O'Hare out of the series. It was not part of the original draft. I have a pretty detailed outline for the original concept of B5, if you'd like me to link you to it. Also - and this has nothing to do with you, and please don't think of this as a criticism in any way, 'cuz it's not intended as one - it's worth noting that we are in the middle of the longest stretch without a space-based TV show since the early 1980s. We've gone three years without one now. So straight forward reboot. Change nothing, just a do-over, and resign yourself to having a somewhat older cast. Doable. Certainly the most efficient way, as you've got all that stuff written, and a working model to compare it to. You could still use Bester with no problems. Walter is in good health (Better, he says, than when he did B5, as he's really taken pains to exercise and diet stuff following his heart attack), and remember: the character was always older than he appeared. (In the books, he's in his 70s). His present baldness could simply be part of his cover. He is on the lam, after all. Fugitives do tend to change their appearances. * A Starship-based series.110 episodes, five seasons. 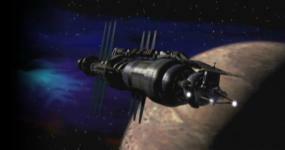 * Babylon 5, a space station-based series, 110 episodes, five seasons. This would start at the same time as the third season of our starship-based series, and run concurrently with it. * A rangers-based show. 110 episodes, five seasons. This would start at the same time as the third season of Babylon 5 and the final season of the Starship-based show. The individual series would take place in the same universe, would overlap somewhat in time, and have occasional crossovers, but they'd basically be independent standalone series. One could watch just B5 or just "Ranger" or just "Starship" and have a complete story without having to watch the other two shows to know what was going on. So we're looking at 15 years/ 330 episodes of a franchise, but owing to the overlap, it'd all take place in 9 seasons. A hellish production schedule, I know, but TNG/DS9/Voy and SG1/SGA proved it's at least possible. Well, firstly it'd be fun. You want to see more of the B5 universe, this could show it from several different perspectives, all of which could compliment each other.Case in point: the first two seasons of B5 are prettty slow, not because they're bad, but because it's a new universe and it takes forever to bring people up to speed. If we dumped those 'unusual alien encounter' episodes into "Starship," it frees up a lot of space for more interesting arc-based station eps. "Starship" is our first show. We get planet-of-the-week stuff, but done modern non-cheezy style, unlke Trek. Just bringing a B5 sensibility to a simple trek-style venue would be a revolution. So season 1, season 2, and then in season 3 B5 starts. Season 4 of Starship is season 2 of B5. Season 5 of Starship is season 3 of B5, which puts it in the middle of the earth civil war. Looking for a way to end your starship series? How about it's involved in the attack on B5 itself, and gets blown up? Some characters die, some are taken prisoner on the station, and then sent off to prison camps. THat's one HELL of a ballsy way to end a series. Added to which, we'd get to explore the EA civil war from BOTH SIDES simultaneously, which would be all kind of fun! Season 5 of "Starship" would also be season 3 of B5, and season 1 of "Rangers," which would be a show about rangers. White stars, rangers running missions, fighting the shadows, recruiting new members. So for a year there, we've got the final season of "Starshiip," the middle year of B5, and the first year of "Rangers" all going at once. Again, this allows us to show different perspectives on the same conflict. The rangers can't understand why B5 is so distracted by the Civil War and not spending enough time on the Shadows, for instance, or a zillion other interesting things. Babylon 5 would end at the end of its 5th season, 2 years after "Starship" ended, and 2 years before "Rangers" ends. This would allow us to see a kind of progression from a human-centric show to galactic civilization, and do cool stuff along the way. It is completely unreasonable to assume anyone would pony up the dough, but as long as I'm daydreaming, this is my best-possible reboot situation. What do you think?